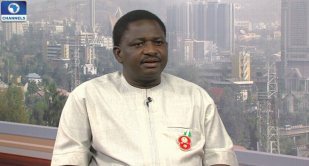 Special Adviser to the President on Media and Publicity, Mr Femi Adesina, is attending the United Nations General Assembly in New York with his boss. In a Skype interview with Seun Okinbaloye on Politics Today, he spoke about the President’s speech at the UNGA, when the President Buhari is expected back in the country and the proscription of IPOB. What is the atmosphere like (at the UNGA) and what is this outing going to bring into the country as benefits? It has been very upbeat. Most Nigerians, all most all, that I have spoken to here are quite happy. They were very pleased with the speech the President gave and I think it is a good time to be a Nigerian. For the other part of your question: apart from the speech to the General Assembly, the President has also held a bilateral meeting with the King of Jordan. Jordan has assisted Nigeria in the fight against insurgency. I think they gave close to 200 armoured tanks to Nigeria at very liberal rates. So, a bilateral meeting (was) held to move that relationship forward. We understand that there was an investment meeting on the sidelines also. What is the import of this meeting? The investment meeting happened yesterday (Monday) and the report from that meeting was very good because you had 80 percent of American businessmen in that meeting and the other 20 percent was made up of Nigerians. So, it was a very good meeting and the prospects are good for our country. The President is also expected to have a meeting with the President of the United States. What is the focus of that meeting? It is a lunch meeting, actually, tomorrow. And there are going to be nine African countries. Nigeria is one of them. There are eight others. So, it is a lunch meeting. You can then imagine that there would be a lot of chit chat over lunch on issues that pertain to Africa because all the presidents there with the American President are going to be African presidents. Well, you will see that there is something that resonates through the speech which is peace and security. And you know that is one of the three main agenda of our President. He has pledged to secure Nigeria, he has pledged to fight corruption and to revive the economy. You will find, running through the speech, issues of peace and security – not just in Nigeria now but across the world because what affects one country now affects almost the entire world. So, the President is looking toward a situation in which the world pulls together in one direction so that humanity can be saved. There are some bilateral meetings where that (will be discussed). It had come up in one meeting yesterday and it will still come up. Tomorrow, he is going to hold a bilateral meeting with the United Nations Secretary-General, you can be sure that is going to be part of what will be discussed. Nigeria has always pushed for a seat on the UN Security Council. This time around we are not pushing for that. Why? Well, the reform of the UN, Nigeria has always championed it and there is a bilateral meeting tomorrow where that will also come up. Last year, it was in the speech of the President. He does not need to repeat himself year after year. That can be done at a smaller forum and it’s going to come up. There are reports back home about whether or not the President did sign the proscription note for IPOB. Did the President sign the proscription of IPOB before he left the country? I read the report also online today, but it is not something I have discussed with him. So, I can’t confirm or deny whether that actually came up before he left the country. Tell us about the President’s itinerary. When is he due to leave New York? When is he due to land in London and when do we expect him back home? I don’t have a definite word on that yet. But I know that tomorrow he is going to have lunch with the American President, he is going to meet with the Secretary-General of the United Nations. Tomorrow is Wednesday. Maybe on Thursday, in the early hours, he has some things to do. After that, I believe that he may be thinking of flying out. One thing is sure; the trip was to last between last Sunday and next Sunday/Monday. Though he is going to the UK, everything will still be done within the timeframe of the trip.